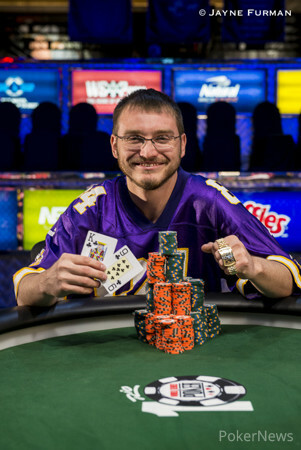 Kevin Eyster is an accomplished poker player on both the virtual and live felt. At just 24 years old, "1SickDisease" has more than $3 million in online winnings and while there are many young poker professionals that have terrific online results, there aren't many that boast the live accomplishments that Eyster can. With a World Series of Poker circuit ring and his name inscribed on the WPT Champions Cup already, Eyster now can add a coveted WSOP gold bracelet to his list of accolades, along with the $622,998 first-place prize. Event #24: $5,000 Six-Handed No-Limit Hold'em drew 541 entrants and generated a prize pool $2,542,700. After 10 levels on Day 1, only 129 players survived and Eyster was one of them, bagging a stack of 73,800, good for 41st in chips. Another 10 levels on Day 2 and Eyster found himself among the remaining 17 players and eighth on the leader board with 477,000. When the unofficial final table of seven players was reached on Day 3, Eyster held the chip lead and after eliminating Mustapha Kanit in seventh place, he further extended his advantage. To say it was smooth sailing from that point forward, though, would be wrong. Five capable players stood between Eyster and WSOP gold. 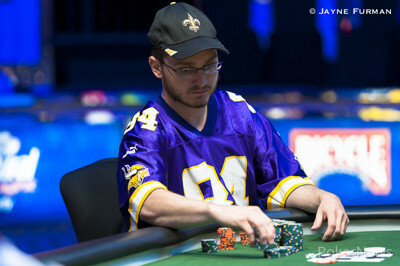 It would take about three hours and 56 hands before the first elimination at the final table occurred, when Jeremy Kottler sent David Borrat to the rail in sixth place. Kotter fell shortly thereafter, kicking off a tumultuous four-handed battle that saw each player hold the chip lead over the course of the following 28 hands before Bryn Kenney fell in fourth place. Andrew Lichtenberger began three-handed play with the chip lead, but ultimately succumbed to a third-place finish at the hands of Eyster. 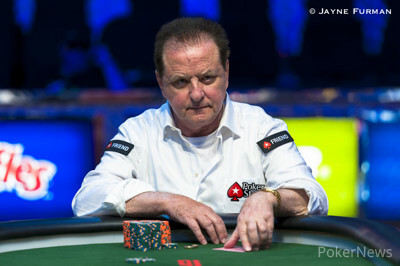 Pierre Neuville began heads-up play with a slight chip lead, but Eyster wasted little time in erasing it. 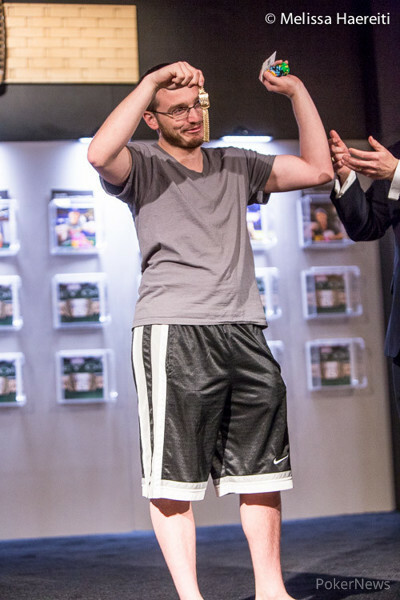 When Day 3 play wrapped up, Eyster held more than a 2-to-1 chip lead and closed it out in less than an hour on Day 4 to capture his first gold bracelet. Congratulations to Kevin Eyster on his fantastic achievement! That does it for our coverage of Event #24 of the 45th-annual World Series of Poker, but stay tuned as we offer coverage for every single bracelet event! Hand #173: Kevin Eyster shoved on the button for 995,000 effective and Pierre Neuville called all in from the big blind. Neuville was in a commanding lead to double up, but the flop came down to give Eyster kings and nines to take the lead. The landed on the turn to give Eyster a full house, leaving Neuville drawing to just the final king in the deck for a chop. The river officially sealed the deal for Eyster, eliminating Neuville in second place. Hand #171: Kevin Eyster raised all in on the button for 1.165 million effective and Pierre Neuville folded his big blind. Hand #172: Neuville gave Eyster a walk. Hand #165: Kevin Eyster shoved for 1.375 million effective and Pierre Neuville folded. Hand #166: Neuville raised to 225,000 on the button and received no action. Hand #167: Eyster shoved for 1.375 million effective on the button again and Neuville folded. Hand #168: Neuville raised to 215,000 on the button and Eyster called from the big blind. The flop came down and Eyster check-folded to a bet of 260,000 from Neuville. Hand #169: Eyster min-raised to 200,000 on the button and Neuville folded. Hand #170: Neuville opened to 205,000 on the button and Eyster three-bet shoved for 1.38 million effective from the big blind. Neuville folded. Hand #161: Kevin Eyster raised to 200,000 on the button and Pierre Neuville defended his big blind. Both checked to the turn of a where Neuville took it down with a bet of 175,000. Hand #162: Eyster received a walk. Hand #163: Eyster raised to 200,000 on the button and Neuville defended his big blind. They checked to the turn of a board where Eyster bet 225,000. Neuville called, the river completed the board, and Neuville checked. Eyster bet 480,000 and Neuville called after a few moments. Eyster tabled for two pair, Neuville mucked, and Eyster collected the pot. Hand #164: Neuville raised to 200,000 on the button and took down the pot. Hand #156: Pierre Neuville raised to 215,000 on the button and Kevin Eyster called from the big blind. The flop fell and Eyster led out for 175,000. Neuville folded and Eyster collected the pot. Hand #157: Eyster raised on the button to 200,000 and took down the pot. Hand #158: Neuville raised on the button 215,000 and Eyster three-bet shoved for 2.145 million effective. Neuville folded, giving Eyster the pot. Hand #159: Eyster folded his button. Hand #160: Neuville raised to 225,000 on the button and won the pot. Kevin Eyster and Pierre Neuville came back to finish a heads-up battle that was paused last night at the request of Neuville. Both players have already achieved their best World Series of Poker finish and are now playing for the title and the bracelet. We caught up with Eyster prior to the match resuming to get his thoughts on playing for the bracelet, the overnight break, and the key hand that got him to today. PokerNews: While you do have a WSOP Circuit ring in a six-max event, this is your best WSOP finish and cash. How does it feel to be so close to a bracelet? Kevin Eyster: I feel great. I’m a little exhausted and drained but I am really excited. I’m just ready to play. Do you think the break overnight helped or hurt you? I am just coming back to more of the same. I think it helped him (Pierre Neuville) out a little bit. He sort of seemed like he was slipping away. They gave us the option to play another level. I wanted to play but he declined so we went home. I respected that. It was a good move on his part. He got some rest, I hope. I didn’t get much sleep so hopefully it helped him out — from his perspective. Of course, I don’t want him to win. You are about 2:1 in chips, what’s your game plan? Same old methodical stuff as yesterday. I need to play patient, small-pot poker and get some big hands and get it in. Your thoughts on the final table? It was a relatively stacked final table, Chewy (Andrew “Luckychewy” Lichtenberger) and Bryn (Kenney) are two of the best in the world. I would rank them in the top 20 in the world and having them at my table was a little nerve-racking. They are good friends of mine and I have roomed with both of them on previous trips, so we are all pretty close. I think they are more talented but I outlasted them and that’s all that matters. Are there any memorable or keys that got you here? There is this one hand. I would just like to say thank to The Grinder (Michael “The Grinder” Mizrachi). He bet 26,000 into a 15,000 pot. I only had 31,000 left at that point. Because he over bet the pot, I just made the call and lost the hand, leaving me only 5,000 left. Had he bet 8,000-9,000, something normal and not over bet the pot, I would have went all in, he would have called and I would have been out. I had $5,000 left and the big blind was 500. I was able to run it all the way up. So thank you, Grinder. No. I am just ready to play. It will be another big six-max for me. I have a circuit ring, a FTOPS six-max and some other win. If I win today, there is talk of crowing me “Six-Max Kev.” We’ll have to see what happens.